Dragon Quest IX: Sentinels of the Starry Skies changes up the standard formula of the series by focusing on some core improvements and multiplayer features. The game is still a great single player experience though for Dragon Quest fans. The game opens up in the Observatory which is home to an angelic race in charge of looking after the humans below. At the centre of your society is the World Tree which grows the vital fruit of Fyggs which allows your kind to pass onto the next world. One day a mysterious force rises up from the world and knocks you down from the Observatory. The player wakes up soon after the strange attack in Angel Falls (the town they were enlisted to watch over just moments before). In order to restore balance it now falls on the player to explore the game world to discover the truth and recover the World Tree fruit that fell from the sky. 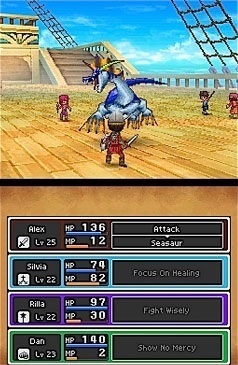 Gameplay is similar to previous games in the Dragon Quest series with players exploring the game, accepting quests to help the NPCs of the world and upgrading their equipment (with the option to craft or find it). Combat features the same turn based style of most Japanese role playing games and doesn’t do anything to try and innovate this combat experience (not that it has to). The player isn’t alone on this adventure with several other characters joining you on your journey which can be controlled by other players through a WiFi connection. 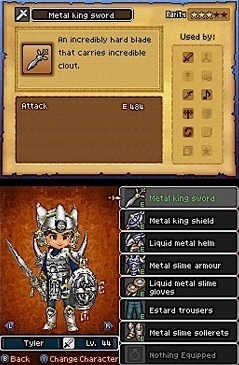 Character customisation is fairly high in Dragon Quest IX with players able to control gender, eyes, body and hair styles for their main character. You’ll also have the option to set your characters vocations which serve as the character classes. Each class has their own stats, equipment and skills to carefully consider when using them in battle. Dragon Quest IX: Sentinels of the Starry Skies is everything you would expect from the genre and while it doesn’t do anything overly innovative it still managers to be a masterpiece. Another hit game in the Dragon Quest series of games. Multiplayer lets your friends jump into your game with you. Heavily customise your characters looks, class and equipment. Same old turn based combat that you’ve come to love.